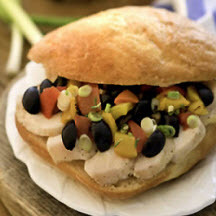 Tender chunks of cooked chicken breast are combined with roasted bell peppers, ripe olives, green onions, fresh rosemary and red wine vinegar, and served on a fresh ciabatta roll. In a small mixing bowl, combine peppers, California Ripe Olives, green onions, rosemary and vinegar. Assemble sandwiches by arranging a few slices of chicken breast on the bottom half of each bun. Top with a scoop of pepper olive mixture and cover with remaining bun. Nutritional Information Per Serving (1/4 of recipe): Calories: 310; Total Fat: 7g; Cholesterol: 60mg; Total Carbs: 33g; Protein: 28g; Sodium: 640mg.